Over the years speaking to thousands of people who manage Millennials, I learned first hand what skills managers wish their Millennials had. As those insights became more and more glaring and urgent, I decided to partner with a team to create specific training for Millennials that would help them perform better at work and deliver the training in a way that engages the next generation learner. As more and more Millennials enter the workplace and step into leadership positions, they require training that will provide a foundation for being a high-performing professional and influential leader. As Millennials rise to new levels of leadership inside your organization, 21Mill equips them with the foundational training they can rely on to propel their career and your organization forward. 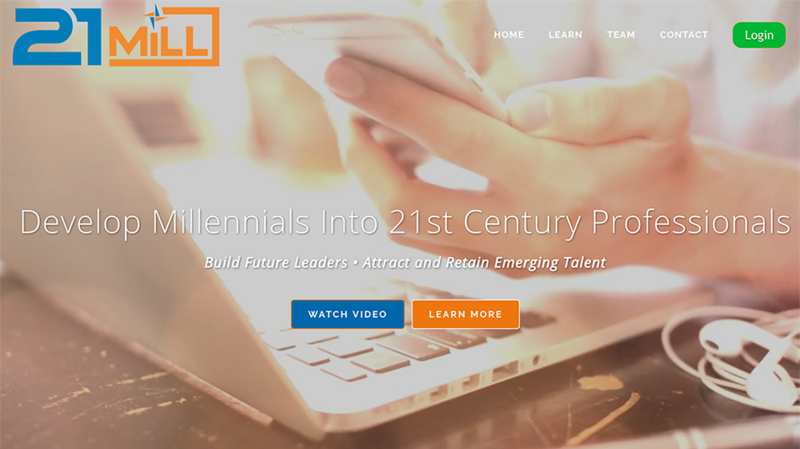 21Mill is an online microlearning platform built to help Millennials succeed in the workplace. 21Milll’s training consists of twenty-one 10-15 minute micro modules centered around Millennial-specific training topics such as Developing a Strong Work Ethic, Overcoming Entitlement, Putting Down the Device, and more. The content can be accessed via mobile or desktop 24/7. 21Mill’s learning process is structured with clear cut objectives in order to optimize transformation and retention. Millennial learners consume rich media content, reflect on what they learn, execute real-world assignments, and then analyze their progress; all the while tracking accomplishments and receiving support from 21Mill professionals. 21Mill is training for Millennials created and delivered by Millennials. Built for today's mobile, high-tech, fast-paced, and next generation worker. This video provides a peek inside the training platform. Small to Large Companies: who have an existing or growing Millennial workforce and want to build future leaders, and attract and retain emerging talent. Individual Millennial Professionals: who are interested in developing individually and performing better at work. One of the greatest talent challenges currently facing employers is developing and retaining the Millennial generation, who recently become the largest share of the U.S. labor market. In fact, 71 percent of Millennials who say they will leave their current employers cite a lack of leadership development as the primary reason. Sixty-eight percent of Millennials likely to stay over five years with a company agree that they have training widely available for them to grow professionally. The absence of training for Millennials represents a serious threat to the longevity of any business. And it jeopardizes the effectiveness of emerging leaders as 44 percent of managers (many who are Millennials) feel unprepared for management when they first assume their role. Training for Millennials is a must. 21Mill offers a turnkey training solution to build future leaders while attracting and retaining emerging talent. It is $210 per user for six-month access. Custom pricing and discounts are available for larger enterprise groups. Contact us to start the conversation. Visit 21Mill.com to learn more or request a free demo. Your organization’s future success depends on the readiness and capability of your Millennial employees.